Use motivational quotes to get back on track when you do get distracted. 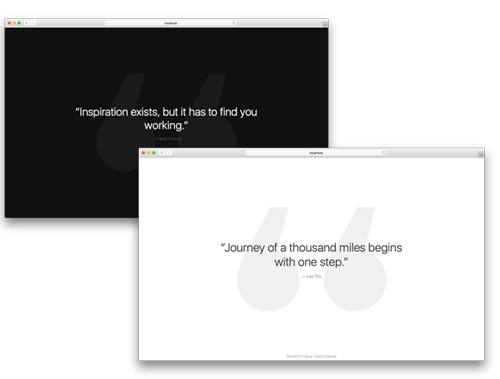 Customize quotes to make your motivation more personal. While focus is active, all attempts to access blocked websites are met with inspirational quotes. Focus comes with a collection of quotations from notable names from a variety of fields. Messages to get you re-engaged and back on track with your assignment. Do have your own pantheon of personal heroes? Are you less motivated by Einstein and more inspired by "Weird Al" Yankovic? No problem. Focus Quotes are editable, allowing the app to present your own personalized collection of motivational messages. You can even quote yourself (hey, sometimes you need expert advice). Willpower wanes from time to time. It just happens. But Focus Quotes can help to give you that little extra push to complete your session and maximize the utilization of your time.